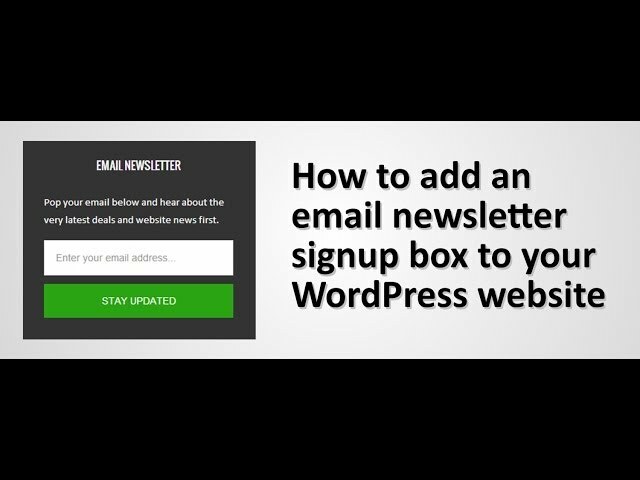 This tutorial video shows you how to add an email newsletter signup box to your WordPress website. The plugin Genesis enews extended is used to easily add an email newsletter signup box to the primary sidebar of the WordPress website. The Genesis Framework and the Metro Pro child theme is being used in this case study tutorial. In the WordPress dashboard navigate to Plugins/Add New and then enter ‘Genesis enews’ into the search box. Install the Genesis enews Extended plugin and then activate it. Navigate to Appearance/Widgets and drag the Genesis enews Extended widget into the Primary Sidebar widget area. Once in the widget area you have a few fields to complete, and here I show you how to link up your newsletter signup form to the email management client MailChimp, which stores and handles my email list. You now have a nice looking email signup box on your WordPress website. Hi! I have a free WordPress theme Affinity and I would like to add a auto responder, and a opt-in form, is there a way to do that? Thanks for the tutorial. i just wanted to know that in WordPress how can i assign a page to be published as a newsletter to be sent to the customer. For example i have created a page for a newsletter, how do i publish it as a newsletter item for the customers?